No matter how well a home is built, over time water and insects will come in contact with exterior door frames. Builders demand products that will resist rot and reduce costly repairs, including door frames. Protecting the base of the exterior frame is the idea behind our patented FrameSaver® technology. Our revolutionary wood composite material is so resistant to rot and insect damage that we guarantee the frame for life with FrameSaver’s transferable. Lifetime Warranty. That’s performance standard. Will not rot, decay or suffer fungal damage resulting from water absorption through the bottom of the frame. Warranty transferable to subsequent homeowners. Composite must be positioned at bottom of frame. Replaces door frame and includes labor, installation, freight and taxes. Requires proof of purchase and photo of defective products. 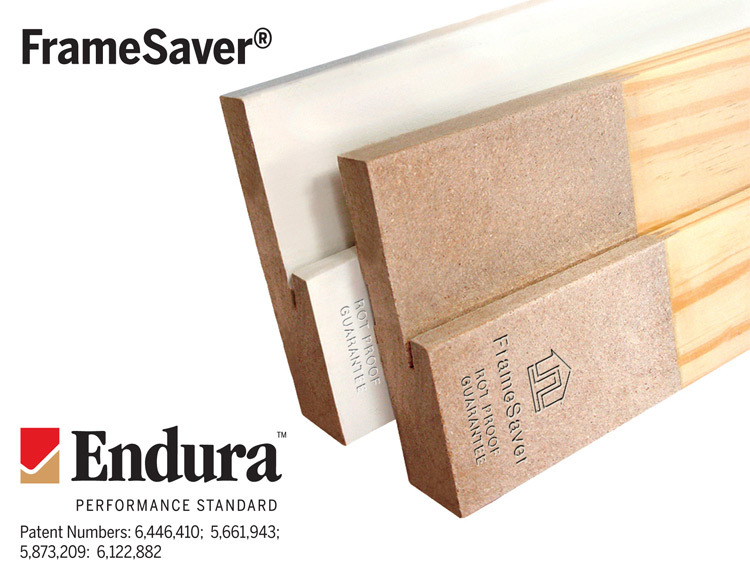 Patented FrameSaver® products are cost effective, hassle-free and last a lifetime. Field Proven: Over a decade of “non-rot” performance. Easily identifiable FrameSaver ® Brand stamped right onto the product. Finishes and paints just like wood. Patented composite bottom won’t absorb water so it won’t rot. Won’t wick water or swell. The composite material is finger-jointed to wood for a perfect fit that maintains the structural integrity of the frame. 180 Day Primer comes standard. As part of a growing commitment to sustainability, Endura Products offers Sustainable Forestry Initiative® (SFI) certified wood products part of our frame and trim components product lines. This is part of our continuing effort to promote corporate and social responsibility. Q: Can FrameSaver® be painted like regular jambs or does it require special paint or application? A: FrameSaver® jambs can be painted like regular jambs and have our 180 day primer applied. Q: Can Endura run widths other than what is listed in the catalog? A: Yes, our catalog only lists the most common jamb widths. Contact your Endura representative for more information. Q: Can Endura apply hinges to jambs? A: Yes. Contact your Endura representative for more information. Q: Can FrameSaver® be stained? A: Yes. FrameSaver® can be painted and stained just like wood. Contact us for more information.